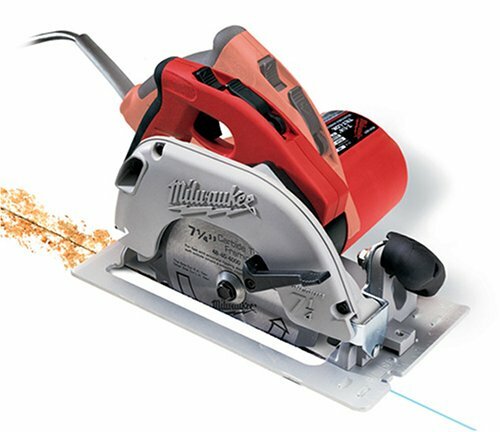 7-1/4" Tilt-Lok Circular Saw With Case, Features 15A Motor, Unique Adjustable Main Handle For User Comfort, Cushion Grip On Front & Rear Handles, Wide & Clear Sight Line & Easy 1 Hand Adjustments. 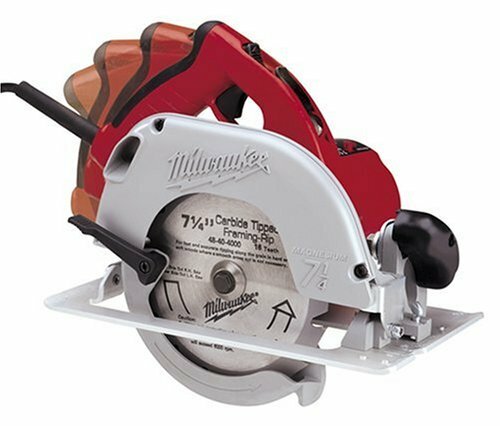 After using cheap skil/sears circular saws for years, I finally bought my first Milwaukee. I used it for trimming roof sheathing on a shed, the balance and power were great! Very ergonomic--Excellent that the blade guard can be held open with your thumb without stretching/straining your hand. This is a pro-quality tool for a great price with plenty of power. I looked in the manual, in clear letters it says "Not to be used by the French or anyone who plays soccer..."
Great saw, except for the shoe. This saw has plenty of power. The quick release height and bevel adjustments are great. The bevel scale is accurate, so once you calibrate it you can set bevels with confidence (in so far as the design of the shoe allows anyway). 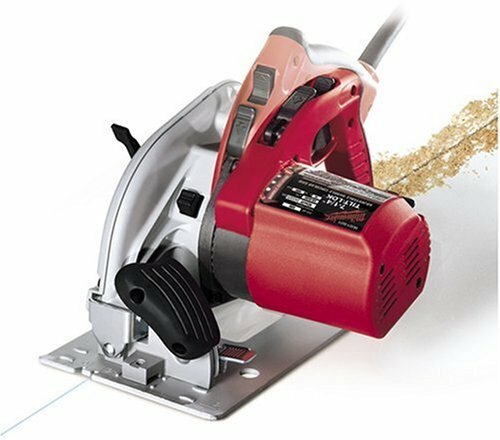 The tilt lock is helpful when sawing a vertical surface. The shoe on mine wasn't parallel to the blade and there's no adjustment. I had to take the saw apart, file some material from the housing where it meets the front mount, and shim to get it in line. This is an important adjustment since when the blade is out of line the saw tends to either wander away from a cutting guide, or push toward it burning the wood. Also, the rear attachment to the shoe isn't very robust. I don't think it will break, but if you push hard on the saw it will flex enough to affect the bevel angle. The good news is that with a sharp blade and the power of this saw you don't feel like you have to push hard. Now that the shoe is adjusted I'm satisfied with this saw, but if I was shopping again I'd look very carefully at the competition. Opinion from a non-professional - TWO THUMBS UP! While not a professional carpenter like many who've already reviewed this excellent pice of equipment I'd like to add my $.02 worth to these reviews. A few months ago I was doing a complete remodel of the kitchen in our rental condo and for the first few weeks my old Skil saw (at least 10 years old and possibly damaged when I used it, with the proper blade, as a concrete saw a couple of years back) was doing just fine. However, when it came time to cut the laminated countertops to length it just wasn't up to the task and it was obvious I'd need a new one. 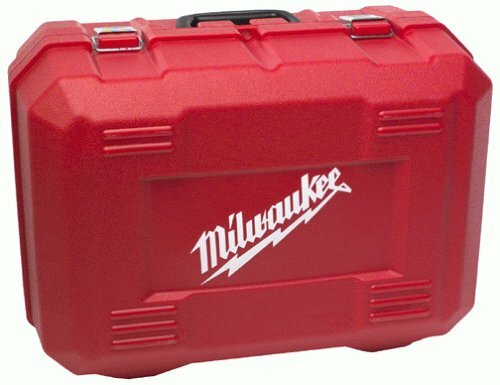 Did a bunch of online research and narrowed my choices down to this Milwaukee model and one from Dewalt. Chose the Milwaukee mostly because of the Tilt-Lok handle and I could not be happier with my choice! It cut through those countertops like the proverbial knife through hot butter and left edges as smooth and clean as if they'd been cut on my Delta Unisaw table saw. 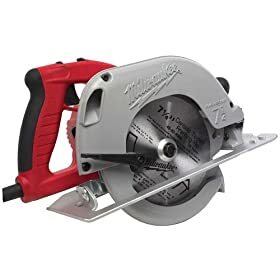 This is one outstanding tool that I'd recommend to anyone who's looking for a really good circular saw that will get the job done and probably last them for many, many years and over many, many projects. I've been using a craftsman for 35 years. I finally broke down and bought this Milwaukee. It flies through treated boards like a knife through hot butter. Wouldn't hesitate buying this product again. Haven't used the saw much yet but was very happy with it when I did. Came with a framing blade, was expecting a combination, but ripped some 2x6 treated and it worked great. Lots of power and good visability. Did not come with rip guide. Carrying case cheesy,awkward to get saw back in. Milwaukee power tools are always top quality. This is exactly that and well worth the price. Great saw. 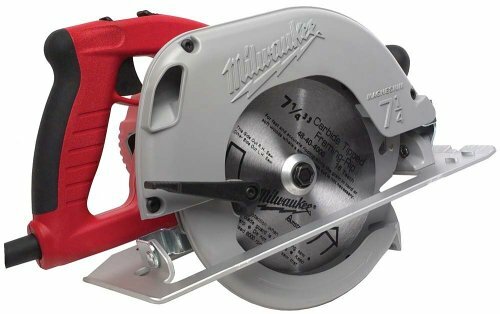 I have always used Milwaukee tools and have never been disappointed. I will always recommend them and this saw is no exception. Comfortable, light weight, cuts nice. I definitely recommend this saw. My father builds houses and has had his current Milwaukee saw for 15 years. I have always wanted one and was slightly dissapointed when this one arrived. Not built as heavy duty as they used to be and I was shocked to see the MADE IN CHINA wording on the saw's spec sticker. I was hoping I was paying extra versus most saws for USA made but unfortunately I was not. My only gripe is the tilt-lok handle has to be placed to lowest angle setting to fit in the case and the cord is not grounded. Has a nice weight to it and is very easy to get straight cuts out of. Included blade is decent. Generally, a good saw. Comfortable to pick up and get to work, but not the kind of tool to set down or store carelessly due to the aluminum shoe easily bending. Saw does get up to speed a bit slow, and it does throw sawdust around. It helps to practice a bit and to use the sharpest, finest blade you can for the work at hand. It's tempting to let the motor do all the work, but stick with good sense and let the proper blade do the work. I generally enjoy the saw and have a great deal of confidence in it getting the work done. I would give it a higher review, but it's not a tough tool, just a good one. I've used this on numberous renovation projects to cut plywood, studs, masonry and fiberboard. It has always performed superbly (using the right blade for the material) I just wish the newer model with the brake was out at the time because I don't see myself needing another. This saw is excellent even after 6 years. This saw has plenty of power for any job, and is the quietest and smoothest running saw I've ever used. Though the stock blade that comes with the saw is good, stick a Freud Diablo 40t on it and cut smooth as silk. I have cut my subfloors, built a planter, cut bracing, all sorts of stuff. This thing doesn't slow down and I am extremely happy with it. Bought this saw from from a brick and mortar store. So here is my first impression. Got it to replace a dewalt dw396. Took it home and unpacked it. Started looking it over and was >SHOCKED<. Not by electricity but where it was made...CHINA! The one on the store display said made in mexico. I can live with that, but china? I guess since milwaukee is owned by a company in hong kong now, production will head that way to increase profits. The fit and finish seem ok as does the large case, but it's what you can't see is what bothers me. I will add to the review as I get some time on the saw To see how it holds up. After using it I decided it just wasn't for me. It cut wood like it was air. Sometimes you couldn't even tell you were cutting anything, excellent! But that's were it ended for me. The saw feels and sounds like a home owners tool. That is to say maybe alittle fragile? The base plate is nothing to write home about although it is nice and big...but It's just ok otherwise. Mine was alittle warped also. I believe a short drop and you will be looking for another saw. The motor area had a strange rattle sound when at full rpm's but still cut very good. Also there is not a pocket for the brush's on the outside of the housing, So changing these will require some work. The mounting brackets for the shoe to the body were very cheap looking. Like something from a $50.00 saw. Although they did work well. All in all It's a good saw. The design and power are way ahead of most others, BUT to me it didn't feel like a comercial saw but would be excellent for the homeowner. I've been building houses for 20 years and I've used nearly all brands. The Milwaukee is the most well thought out of all of them by far. It is as though they were recording all my mental notes over the years about what was wrong with all the other saws and then corrected them. Great power, sight line, weight, base plate strength, adjustment levers, adjustment handle, blade guard sensitivity, etc. No need to buy another saw. Don't change a thing, Milwaukee.